WOW! What a Beautiful Place - Open May 19 to 25! Owner Direct 571 - 999- 3533 Residing in Orange Beach, Alabama,Turquoise Place resort is located on a sugary white beach, drips with amenities, and beckons a low key, care free, private lifestyle. Amenities are generous at Turquoise Place. Waddle the hours away drifting on the lazy river and soak up the sun with a cool drink on the expansive deck. Nearby is a playground for small children. A grand two story indoor recreation area features a pool, two hot tubs, and a deck overlooking the Gulf. Relax in the adjacent therapeutic sauna and steam room, designed with mosaics in the Turquoise signature style. Exercise with free weights or state of the art Nautilus machines. A heated curvilinear outdoor swimming pool facing the Gulf features water fountain sculptures and a tiki bar. Every detail throughout the resort is a delight, inside and out. The architectural design along the Perdido Beach Drive corridor features modern curved glass walls reflecting vibrant rhythms of the Gulf. Facing the beach, generously sized balconies offer expansive views of glistening water by day and shimmering moonlight by night. Upon entering the covered parking area, a interior courtyard reaches to the sky, featuring a four story water wall. Just steps from parking, one of 6 signature elevators will whisk you up to Rejuvenate. The unit offers panoramic vistas of the Gulf without missing the sound of waves gently lapping on the shore. The unit is centrally located, offering east and west views of glorious sunrises and sunsets. The spacious 2400 sq. ft. unit offers a living area, kitchen, master suite, 2 bedroom suites, laundry, and a three and a half baths. With ceilings at 10 feet, a full height hurricane resistant glass wall facing the gulf welcomes natural light into the master bedroom and living area. The unit is wired for voice, high speed data, and cable. Amenities throughout include luxury faucets, granite counter tops, and quality appliances. In addition to the living area, a generously sized 400 sq. ft. balcony offers lounging and dining. Saunter away quiet moonlit evenings in the Jacuzzi tub or enjoy your favorite fare from the grill with family and friends. At the flick of a switch, a glowing fireplace sets the mood in the spacious living area. Enjoy soft music or a favorite cable channel or movie with surround sound on the 42” flat screen TV. Xbox 360 is also available to play your favorite games. The master suite features a bedroom sized for a king. The master bath Jacuzzi tub offers multiple options to sooth, relax, and rejuvenate. The bath also includes a double sink vanity, and glass shower with multiple water heads. The kitchen is equipped with appliances fitting of a chef’s dream. Gourmet meals may be prepared with the assistance of a Wolf gas stove, convection oven, warmer, and microwave. The kitchen also features a generously sized Kitchen Aid refrigerator and dishwasher. Enjoy wine chilled from the wine cooler, or mix a cocktail at the bar, conveniently located adjacent to the kitchen and living area. An oversized ice machine will more than supply your needs if cold drinks are in order. In addition to the master suite, two bedroom suites offer quiet separation and full baths. One bath features a Jacuzzi tub and the other, a glass shower enclosure with a luxury shower wand. Turquoise Place provides a signature lifestyle experience to those with discerning taste. If you have the desire to relax, rejuvenate, and enjoy the good life, this condominium unit is for you. Won’t you join in the privileged lifestyle experience? Note that we are owner managed and no person should ever ask you to send a check or wire transfer. These payment methods are not the safest and renters are strongly encouraged to use the VRBO website for secure payment. The building management has a 2 car limit per unit. One parking space is designated with our unit number, and the other for the 2nd car will be open parking in the garage. Parking passes and keys are provided at check in at the lobby desk in the D building. They will ask for a drivers license of the guest name we have on the reservation. The requirement is that the guest be at least 25 years of age and that the adult remain in the unit the entire booking period. We also have a clean beach policy at Turquoise Place, which means that personal items cannot remain on the beach overnight--other than those items placed voluntarily in the unlocked bin provided by the property for all Turquoise guests. 571 999 3533. The owners have 2 kids and enjoy sharing the beach with family and friends. Our families have been visiting the beach annually since the 1970's. Our children love to swim and play in the sand. The beach is a great place to unwind, feel the sand between our toes, and enjoy the salt water air; the best place in the world to rejuvenate! Top attraction is breakfast on the balcony overlooking the waves and a grilled fish dinner on our balcony grill at sunset. We also enjoy the private jacuzzi on our balcony listening to the waves hit the shore. We love the amenities and the gulf views. The lazy river with a cool drink can't be beat in the late afternoon, while morning walks on the beach collecting shells breathes life into your soul. Orange Beach has the finest white beach in the world, and the city is doing a great job protecting the beach and enforcing family friendly policies. Our kids move easily from the lazy river on the 4th floor in our building to the indoor pool (same level) and then to the outdoor pools at the lobby level and to the beach. Rotations walking on the beautiful, fine, white sand and jumping the waves to enjoying the pools and saunas keep our busy kids moving and us in relaxation mode. The well-stocked gourmet kitchen and the grill on the balcony make eating a joy without a need to leave the condo. We also love immediate accessibility to the beach and the option to swim in multiple pools/hot tubs/lazy river at any one time. Eating meals on the balcony and listening to the waves is satisfying to the soul. The most unique benefit is the relaxing and rejuvenating atmosphere of our unit. 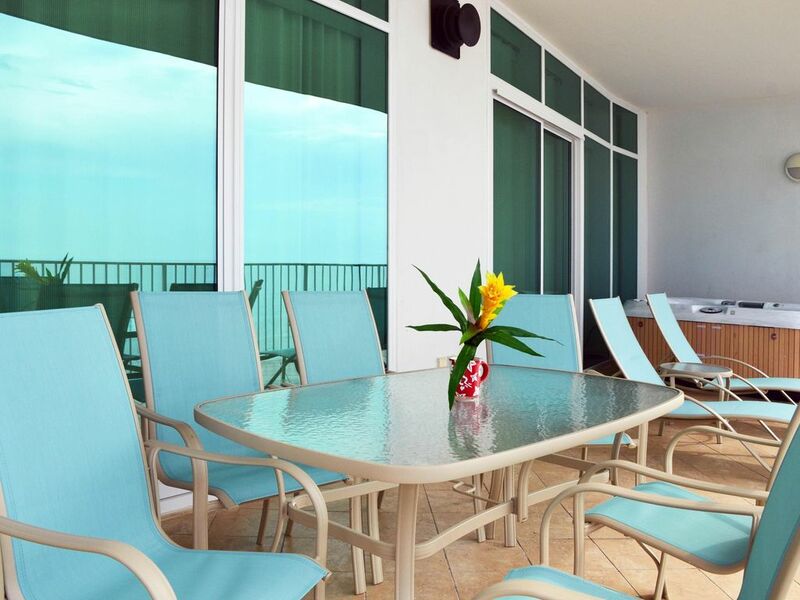 The unit is tastefully decorated with bright beach colors and is exquisitely maintained. We've been told we have the cleanest condo guests have ever chosen! When we arrive at the unit, we are swept away to a world free of worries! Note that the inside pool is heated as are the jacuzzis. The outdoor pools and lazy river are not heated. We are not affiliated with management companies. If you want information about payment options other than credit card or echeck, please ask. All the amenities are impressive: indoor and outdoor pool, lazy river, steam room, dry sauna, tennis court, restaurant on premises. One of the best views in the building. In the stack that is furthest out so the view is most broad. Right on the beach with awesome views and the sound of the waves are so relaxing. We have 2 spaces in the garage under the building for our guests. One is marked with our unit number; the other is allowed in any open space in the garage. Additional cars will be offsite. (4) All TVs are HDTV Flat Screens with Blu Ray in the Living Room. Large private balcony with hot tub and grill. Available for rent on the beach seasonally. Balcony has private hot tub. The condo was everything it says and more! Kelley is a great host and easy to work with. We are already talking about planning another trip to this condo! Would definitely recommend to anyone looking for a great place on the beach! I've been renting condos in Orange Beach/Gulf Shores area for decades ... this was one of the best ones yet. I've wanted to try the Turquoise for some time and finally had the chance. Beautiful decor, professionally decorated, well stocked kitchen with great cookware, bar, etc. Furniture very nice and beds extremely comfortable, bathrooms great as well. Had 1 question and texted owner and she was on it immediately and kept me posted, took care of right away. Would stay here again and again! Thank you so much... enjoyed your beautiful place. We had a great relaxing time . Condo was amazing ,no waiting in lines at restaurants, very little traffic,and weather was terrific .only thing the condo needs is a flat screen tv on the balcony by the hot tub. Beautiful condo, superb beaches. Overall great vacation. Off-season, so things were kind of quiet. Enjoyable, relaxing stay. This condo is beautiful and the owner is very nice. Our family loved it. The view is perfect. We plan to stay here if possible for many family vacations to come!!!!! We really enjoyed our stay. Everything was beautiful and very comfortable. The place is great! NEVER WIRE FUNDS FOR THIS PROPERTY. The Owner doesn't accept wire transfer. We are owner operated and offer personal service. We have local representation. Our reviews show we are doing a good job and can be trusted to offer you a great vacation experience. Rates are subject to change until reservation is confirmed. Deposits are returned within 15 to 30 days from departure pending property inspection for damage / loss.